When it comes to HECM loans, there are quite a few reverse mortgage myths and misconceptions. Here, we’ll discuss the top 6 reverse mortgage myths. In some cases, the reverse mortgage myth exists because the idea or concept USED to be true, but no longer is true. First and foremost, people often say that reverse mortgages are scams. Many times that phrase is followed up by a reference to the “bank getting your home”. Sometimes I hear other reasons it’s a scam (some of which we’ll discuss here). At the end of the day, a reverse mortgage is a safe, FHA insured home loan that allows you to access a portion of the equity in your home and convert it to tax fee cash. It does not require a monthly payment for as long as you live or for as long as you live in your home. Hence, you can’t borrow 100% of your home’s value because the loan balance increases if you don’t make a payment. Either way, the reverse mortgage isn’t a scam. It’s a financial tool that can be used as a strategic back up plan for homeowners that are well prepared for retirement. Or, it can be used as more of a product of need for those that were less prepared (or had some sort of life emergency that consumed funds). Your heirs will inherit a liability or burden. The fact is, if there is equity, that money is 100% yours if you sell your home (naturally the loan has to be paid off). Moreover, the same applies to your heirs when they inherit your home. If it came to pass that there was no equity due to a market crash or something, your heirs are NOT responsible for a debt greater than what the home is worth. The only thing that can be used to pay this loan off is the home. No other assets can be touched to repay the loan. If there is a shortfall, FHA pays the difference. There are tough credit requirements. The truth of the matter is, a reverse mortgage has more lenient credit qualifications than a regular mortgage. In fact, your credit score doesn’t even matter at all. However, there are a few basic reverse mortgage credit requirements. It’s not quite a free for all. There are stipulations dictating how reverse mortgage funds have to be used. If there is enough money left over after paying off your existing loan, you can do what you want with the money. However, in some cases some money may need to be set aside to pay for property taxes and insurance. This only happens if you can’t pass the credit willingness test. There could potentially be a small amount of money set aside for needed repairs. The lender owns your property and not you. This loan works just like a regular mortgage. The bank does not own your home nor do they go on title. However, it is a loan secured by YOUR property. If should decide to sell your home, you’d have to pay off the loan. Then, any additional proceeds to the sale are all yours. When the home is ultimately sold, any leftover funds belong to the lender. The fact is, the homeowner (either you or your heirs) gets 100% of the equity. Naturally, you may be subject to realtor fees, but once the loan is paid off with the proceeds of the loan, you get all the rest of the money. 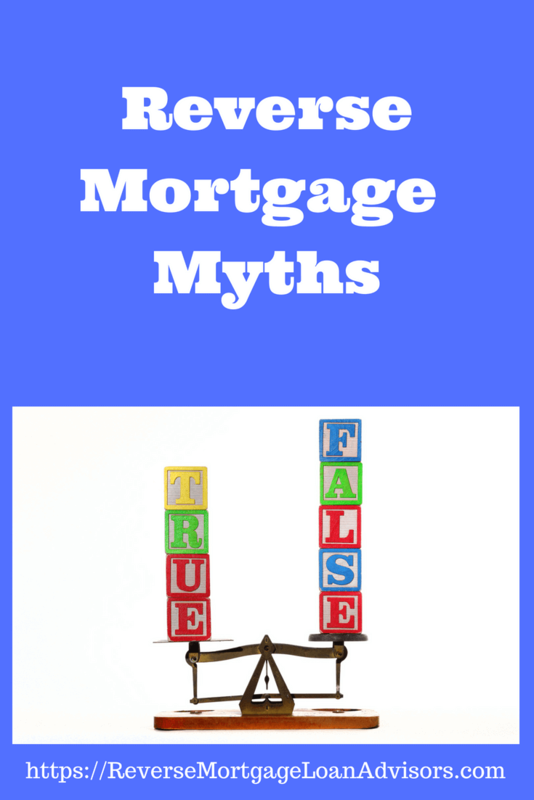 There are quite a few funky reverse mortgage myths and misconceptions out there. These are just six of them. In reality, this loan works a lot like a regular mortgage. In contrast, It has an age requirement (must be 62 or older) and equity requirement. One of the biggest reverse mortgage pros is that there are no monthly payments due. ⟵Reverse Mortgage Fees and Costs – What Fees Can You Expect?